House of Mutt Blog » Christmas Cheer?! Papers are full of horror stories about the Christmas health hazards for dogs at this time of year (ie Daily Mirror ‘More than 6,000 dogs are expected to have suffered chocolate posoning in 2016, a quarter of cases in December alone….‘). No need to scaremonger, we are after all all grown ups and kind of understand it’s best not to feed dogs chocolate brandy ice-cream, but here are some thoughts from us here at the House of Mutt, and, below those, a good summary list from the British Veterinary Association. Christmas Pudding, Christmas Cake, Mince Pies – yuk to all three from my point of view, but most dogs don’t agree. They are unfortunately jam packed with raisins and sultanas (see above,re grapes), booze and fat – none of which will do a dog any good. Tree decorations, even if they’re not chocolate. 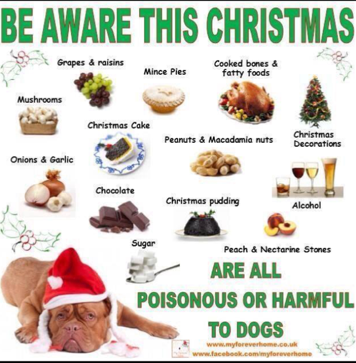 The BVA reported 10% of dogs treated last Christmas for foreign body ingestion, were for Christmas decorations. Not so good. Toys. The BVA reports that last year almost one in five vets saw dogs that had eaten a non-edible gift given to them by their owner. Plants such as poinsettia, holly and mistletoe. Yet again, pretty tempting; very poisonous.